As I have mentioned lately, I am moving back to California in a few weeks. And in California, almost every single apartment/house/rental you apply for, you have to pay an application fee and a credit check fee to the landlord. Because I have been looking for (and finally found) a cool place to rent, I have been putting in applications for various houses, all of which initially required both the application the credit check fee. I don’t know if there is a standard charge for these fees, but the people I talked to wanted a $25 app fee and a $35 credit fee. Realizing this was going to get expensive, I decided to do something about it; I ran my own credit report and got a copy of my own credit score. I now had copies of information that landlords were going to charge me $35 for each time I applied for a place, and it only cost me a one time fee of about $7. Sweet! The first thing I did was go over to Annual Credit Report and get one of my free credit reports for the year. You are allowed one report, per year, from each of the three credit reporting agencies – Experian, TransUnion, and Equifax. I usually run at least one report a year anyway, just for my own records and to see if there is any strange activity on my account, but this year I had not run any at all. So I chose Equifax for this free report, filled out the information, answered a few questions pertaining to my financial history, and out came my credit report in PDF format. It was about 25 pages long, but the most important information was on the first few pages – my name, a summary of my account history, inquiries for my report, and my debt to credit ratio by account. Just from these pages you could see what accounts I had, see that I have no negative information recorded, and that I owe $0 in debt, including any auto loans. So far, so good. However, your credit score doesn’t come free with your report, so you have to pay for that separately. I cannot remember how much the charge was, but $7 sticks in my mind as being the amount. (Which is a lot cheaper than $35 each time you apply for a new place!) I paid the charge with my credit card right on the Equifax site, and got my score, which is near the top of the credit score range of 300-850. I now had the documents I needed to provide to any potential landlords, without having to A. have them run my credit every time I applied and B. spend a small fortune having them do so. I printed out a few copies of my credit score, along with the first 5 pages of my report, and had them ready to submit with my applications. While a friend of mine did run in to someone who wouldn’t accept his copy of his report and instead wanted the fee to run it themselves, I didn’t have that problem at all. Every landlord I talked to gladly accepted my paperwork as-is, and only charged me the application fee itself. And surprisingly, the owner of the little bungalow I finally rented didn’t even want the application fee at all! I only needed to give him some info about references and my self-obtained credit report/score, and we were good to go. I signed my lease, and I move in to my new place in just a few weeks. 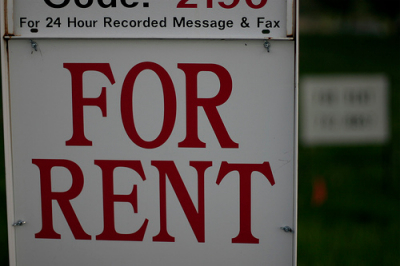 So next time you are rental hunting, consider getting your credit report and score yourself. It could save you a ton of money if you end up applying for many places, and it could even speed up the process as you have all the information your potential landlord needs available right away. Good luck! Ibelieve my credit score is wrong. How do I actively persue having it changed for the better? What a great idea; I’m definitely going to do this. I already pay a monthly fee to access my credit score / report, so may as well put it to use in my house search.